Columbus football, led by head coach Dan Grundy, made history and reached new heights in 2015. 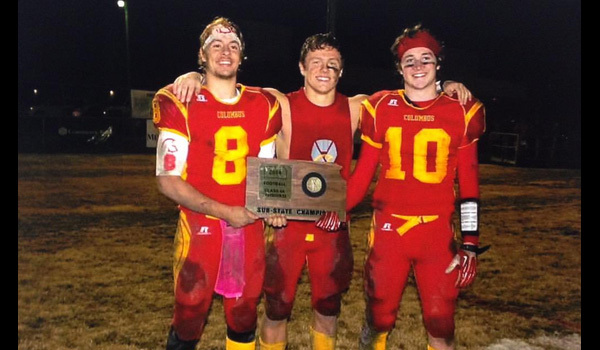 The Titans played in the school’s first ever state championship game in football as they took second in 4A-II, losing to Andale in the first ever 4A-II title game. A big reason for their success was running back and linebacker, Jace McDown, now a senior at Columbus High School. McDown rushed for over 1,600 yards and 20 touchdowns on offense as a junior in 2014. On defense, he registered 98 tackles, despite playing limited time due to the need of using him on offense. McDown will be the first to tell you it was much more than him in getting the Titans to the title game a year ago. In fact, when we asked for a senior photo of him for the feature, he insisted we use one with his teammates. “It was awesome getting to experience the year we had with my teammates. It was all about not letting the guy down next to you. It really helped take us far.” McDown said. McDown is not just a football player, he is also an exceptional student featuring a GPA of 4.0 in the classroom. He was the runner-up this past fall in state power lifting for 4A. He features a bench press of 340 pounds and squats 500. As a sophomore, he won state wrestling at 182 pounds. Not only was he a KSHSAA state champion in high school, he had won four other state titles in the nine years of wrestling in youth leagues until high school. However, McDown is no longer a wrestler in a community that is known for its wrestling. “I stopped to focus on football. I was losing five to seven pounds a day just wearing shorts and a t-shirt, I was trying to gain weight for football and it’s almost impossible losing that much weight in just a couple hours.” McDown said. There’s a reason that he was the runner-up in power lifting last year as a junior. He is a weight room warrior that lives in the gym. McDown lifts when he is bored. He even spent time this off-season training for speed and explosiveness with College Football Hall of Famer and 10 year NFL veteran Mark Simoneau at Simoneau Sports Performance in Overland Park. “Jace is an extremely coachable athlete. He has a great combination of speed, power and work ethic.” Simoneau said. Now a senior, standing around 6-foot and weighing 220 pounds, McDown is ready for another big year for the Titans. Gone is all-state linebacker, Taylor Watkins, now a wrestler at Mizzou, but the Titans return several key pieces to the puzzle for 2015. Although he will be depended upon heavily on offense, defense is where he will be relied upon the most. Linebacker is also the position colleges are recruiting him at. Columbus, who will be one of the favorites to be the east representative in the 4A-II title game, is the preseason #1 team in the CNC league coaches poll and will open the season against Chanute, a team out of SEK league in 4A-I. The Titans beat Chanute last year 25-14. We caught up with the all-stater below. Special thanks to Team Threads in downtown Columbus and Farmers Co-op in Columbus for sponsoring all high school features from Sports in Kansas in the Southeast Kansas area over the last two seasons. I got involved in Sports at a very young age. My parents couldn't keep some sort of ball out of my hands so they put me in soccer when I was 5, they put me in it just to make me lose some energy. I liked it and had fun but when I was old enough to play football it pretty much took over. What was last year like for the great year you and your team had in football? We did have a great year last year, and we were happy to bring so much pride to Columbus, and the support we had was crazy. It seemed like the week before the State game the town was doing something for us every night. However, we still didn't win and that's all our eyes are on right now, is getting back there and getting another chance at it! Starting with the first game of the season. What was getting to state like? The feeling was amazing. We had all talked about it since we were in 3rd grade. We had some really good teams here that didn't make it past the quarterfinals. Those guys were our idols too, so we didn't know if we really had a realistic shot until we stepped into the weight room the first day of summer before the season. Everyone there had a common goal and we didn't even have to say it aloud, we all knew what we wanted and we were gonna go get it, no matter what. What keeps you motivated as a player? A lot of things keep me motivated, but the main one is that when I step on the field on Friday night I don't want to let the guy next to me down. Not performing up to your own par is one thing, but when you have one job and the guy next to you is counting on you to do it is a whole other thing. He is going to do everything in his power not to let me down so I have to do the same for him. What do you do to train in the off-season? I've learned a lot of different training methods and workouts over the last couple years and this summer I finally put them all to use. I used to just lift and run. Now I do a lot of different stuff like: Speed training, Agility, Plyo, power and explosion drills, balance, a lot of core and stretching, I've also been eating a lot healthier which is a very overlooked part of training. How has summer training been? We had team weights at 6 AM until 7:30AM. After that's over I'll stay up there for probably another hour or so and do my balance, speed, and some extra core stuff. I'll take the rest of the morning off and then at 3 or 4 I'll go back up to the gym or stay at my home gym and do some sort of cardio, power and explosion, and Plyo. Recently I've been mixing in a lot of Cross Fit workouts for muscle recovery and stamina. Then a few nights a week some of us will come to my home gym and have a late night workout. What was it like to train with a former NFL player like Mark Simoneau? Training with Mark was awesome! I went up there for combine training and it helped a lot. My 40 time improved tremendously. He helped me with my speed and 40 Starts. He also took off .4 seconds on my 5-10-5 time. I was very happy that I got a chance to train with him. Was football the reason for you to stop wrestling? Yes I did stop wrestling to focus on football. During wrestling practice I'd lose 5-7 pounds a day just wearing shorts and a t-shirt, I was trying to gain weight and it's almost impossible losing that much weight in just a couple hours. Wrestling is such a grueling and demanding sport for every body part it was hard to lift and keep my strength because I would be so tired and sore from practice. Who are some of the key players returning this season? We have a lot of great players on our team this year that have started two or three years for us. Javohn Morrill WR/CB could run down a deer I'm pretty sure. His game speed is insane. When he turns the corner on a sweep play I start getting ready for PAT because no one is catching him. Trey Robinson QB/OLB has a cannon on him. He hasn't seen as much playing time in the last 3 years at QB because Nate Bole was there too. But watch out for him this year to put up some big numbers even though we don't throw the ball a ton. Keenan Stanley is a good athlete playing WR/CB. Him and Javohn compliment each other very well, Keenan being a jump ball player and Javohn being a get it in space and run type of guy. Our whole O- line is great. They're the reason I put up some good numbers last year and we are returning our center and whole right side so look out for all of them. My FB and fellow LB Ethan Martin had quietly quite a few tackles last year. When I'm at RB behind him I don't really worry about anything because I know he's going to do everything in his power to not let anyone touch me. Plans at the next level, any offers? I have a few juco offers and I've talked to most of the Missouri Valley Conference, MIAA and a few FBS schools. Most of them said they need to see me in person this year to get their final evaluation. Win State, and have a great time with all my brothers on the journey there. What do you do when you’re not lifting or playing football? I have a major addiction to Fantasy Football. When I'm not training for real football, I'm probably trying to make a trade or pick up a free agent to improve my team. What is it like to grow up in Columbus? Growing up in Columbus is great. There's not too much to do here, so everyone looks forward to the county fair and Friday Night Lights. So when those Friday Nights do come it gets pretty crazy down here. The support is unreal. The whole community has a family feel and whether you're driving to the grocery store or riding your bike around town it's impossible not to see someone you know. I know for sure when I go off to college I'm going to miss that and everything about Columbus.